The Rechargeable Mighty Purse Zipper Wallet by Handbag Butler is a must have! This brilliant wallet combines class and practicability perfectly. 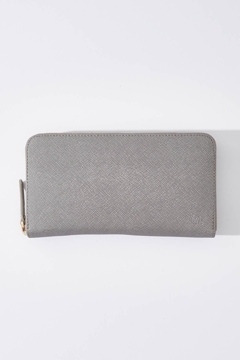 Not only is this wallet a gorgeous piece, this wallet will also be your secret weapon. The quality speaks for itself. Enjoy! Compatibility: All Micro-USB Smartphones Including Samsung®, HTC®, Blackberry®, LG® & Android Smartphones All Apple® iPhone with Lightning Connector Including iPhone 5, 5s, 6, 6 Plus, 6s, 6s Plus. This exceeded my expectations so much room inside for cards etc and a phone charger it's come in so handy already and I love the grey colour!